What's more exciting than watching traffic? Anything, you might say. But on this day, seven-plus months in the making, you would be wrong. 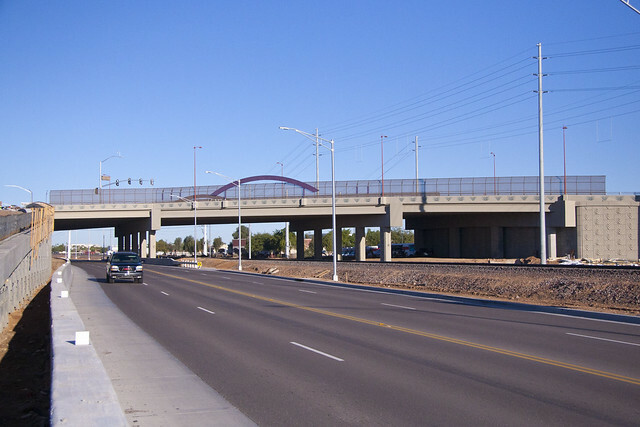 Earlier today, we opened a bridge carrying Bell Road over Grand Avenue (US 60) in Surprise. So we hope you'll join us in watching a little traffic and celebrating a big day for ADOT and the West Valley. Please start by using the slider above for a before-and-after view of the area now containing the bridge. Then enjoy the slideshow below of what the bridge looks like on opening day. This $41.9 million ADOT project was able to complete the majority of work before the holiday shopping season because, with input from the community, we closed Bell Road at Grand Avenue starting April 1. We offered access to area businesses throughout with a convenient detour route. Frequent visitors to this blog will recall frequent posts about this important project. We'll scale it back a bit from here out, but do look forward to us updating you on opening new eastbound lanes of Grand Avenue and completing ramps connecting Bell Road and Grand Avenue. With all work scheduled to end before the start of spring training baseball in Surprise, we continue to offer convenient access to area businesses. It's all the more convenient as of today with Bell Road reopened.